The end of the year lists should be upon us this week from every media outlet on the planet. There are a lot of guides out there on how to attract more readers to your blog, and they all tout doing more lists, but for BHS purposes, longer form posts just make more sense. You can't really review a restaurant in a Top 10 format. But I do have one list for you every year, and it's my own little awards show in a post: The Big Hungry Awards. 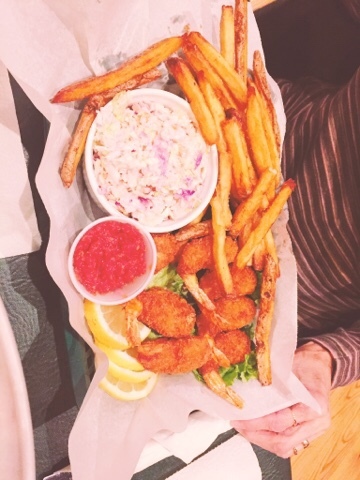 Annually, I pick the best of what I ate and where I ate it in New York State the previous 12 months. I might have had a better bacon dish in Germany or Philly, but these awards are limited to New York State, as that is really the focus of my blog. So if you're looking around for somewhere really tremendous to stuff your face over the holidays, I've got you! So here we go, let's not beat around the bush. The Best Appetizer of 2016 is probably also my favorite dish in all of the Southern Tier: the Angry Lobster at Social on State. I'm popping this into the appetizer category because Social does all small plates, although I would eat this as a main course, given that the sheer amount of wine and butter in it calorically qualifies it as a full meal. 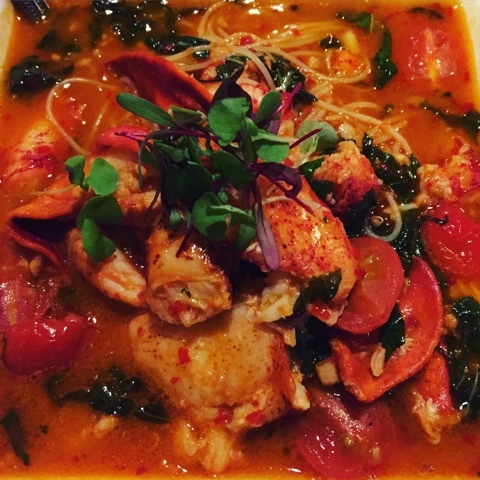 It is rich, spicy, and just a tiny bit sweet - balancing out all those flavors with huge, tender chunks of decadent lobster. I love it. Salads are not usually my jam, as you know, but I do like to give you all a Best Salad category because plenty of you probably like them. While this salad wasn't extraordinary in and of itself, the dressing was so good, I was eating it off a spoon by the end of the course. 2016's Best Salad can be found way up in Morristown at Ella's on the Bay, and the big winner is Ella's delectable homemade ranch dressing. This stuff was thick, garlicky, and bursting with fresh herbs. Absolutely fabulous. Hand and Foot is a relative newcomer to Corning's Gaffer District, and we absolutely loved everything we ate there for lunch last January. 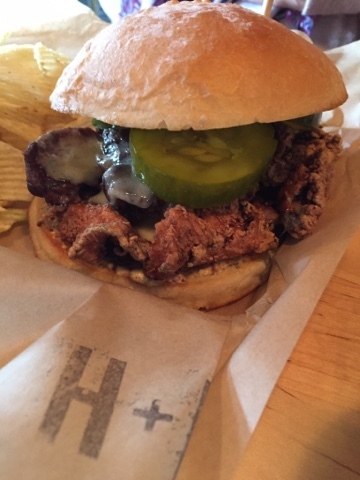 The fried chicken sandwich stood out, not only for its crunchy house-made pickles and expertly fried bird, but the thick-cut local bacon on it. The bacon was sweet and smoky, balancing the other flavors and textures on the sandwich handily. It was my Best Bacon dish of 2016. Side dishes, overall, were not super strong this year, but I like to recognize perfect french fries whenever I can, and The Barley Pub, in Belleville, is doing them right. These hand-cut, double-fried, well-seasoned beauties take Best Side Dish of 2016 in my book, and we will be back for more. Well, we've had our appetizers and salad course, we better move on to the entrees. There were some excellent ones this year, but I'm giving the prize to Gilda's, in Skaneateles. 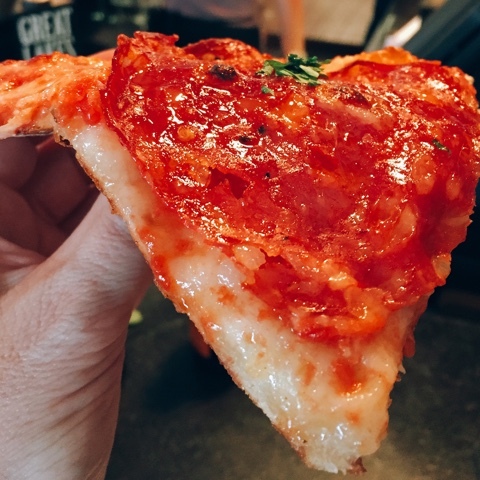 This charming bistro's cozy interior, superior wine list, and small menu of pizzas and small plates won us over immediately, and that impression grew even more rosy with the hot soppressatta pizza, topped with spicy Italian salami and honey, plus pecorino cheese for a little tang. This was the Best Entree of 2016 for my taste buds, because the sweet and the heat played off one another so well, and the cheeses were high enough quality to lend their own personality to the overall flavor. My next winner is, sadly, a restaurant that is about to say goodbye. It's a favorite of my family's, so I'm bummed to see Carol's Cafe go. But Carol, the chef at the helm of this Staten Island institution, is retiring, and more power to her! I will miss her quaint cafe stuck in the middle of that bustling island, and I will miss her absolutely singular caramel shrimp appetizer, which has won my Best Appy accolade in the past. 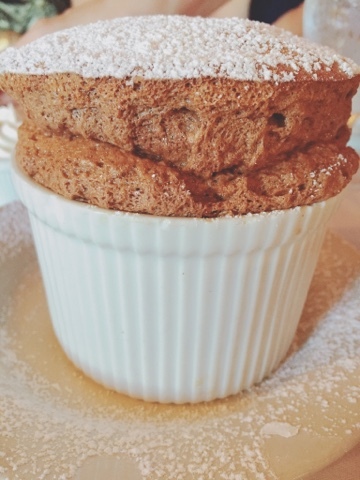 So this year, Carol's gets my award for Best Dessert for her gorgeous, light-as-air chocolate souffle. Like Carol's Cafe itself, this dish is a masterpiece - a rare treat to find on a menu anymore, and something most chefs just aren't willing to bother with. Now that Carol is retiring, we will have one less spectacular souffle in this world, and we will be the poorer for it. 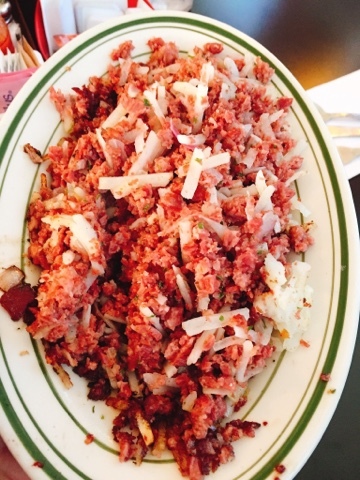 Corned beef hash is one of my favorite breakfast treats, and it's not easy to find a really good, house-made one in Upstate NY. That's why I was so enthusiastic about the excellent hash at the Highland Park Diner in Rochester over the summer. This was pretty straightforward corned beef and potatoes shredded up finely and crisped on the flat-top griddle, but some fresh parsley in the mix lifted the flavors up a bit, and there was a bit of sweetness in the beef brine that was a nice counter to the overt saltiness you typically get from all that cured meat. This dish wins my Best Breakfast award this year. Best Ambiance was actually the first award I decided on this year, because it was the easiest to point out. 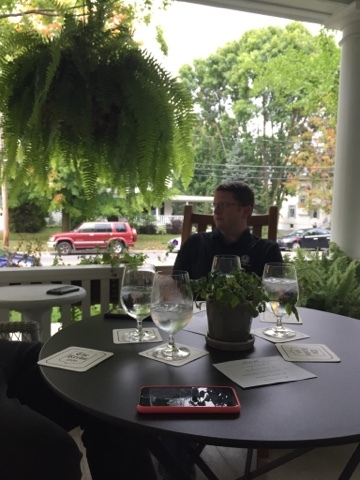 The Krebs, in Skaneateles, is simply one of the most gorgeous dining experiences I've ever had, in Upstate NY or anywhere else. From the gracious front porch, framed in ferns, on which to enjoy cocktails, to the cream and dark wood interior decked out with modern, posh lighting and lots of fabric to absorb sound and render peace, this restaurant has been lovingly remodeled into the most luxurious supper club you'll find. I had a few notes on the food in my review back in September, but the ambiance and service of this five star locale were not among them. I started a new category last year called Best Surprise, and I wanted to stick with it this year. The choice was really easy - Ella's, in Morristown, again. Have you ever been up to Morristown? It's little, you guys. There is a funeral home, a tiny marina, and maybe an insurance office in this village, and then Ella's. What they are doing, from a culinary standpoint, at this restaurant is far more than they need to do to be successful, because they have a clientele of locals built in due to being the only game in town! 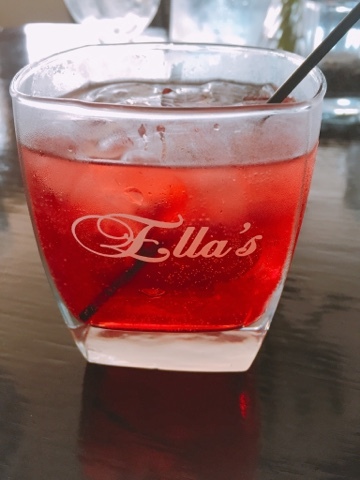 And yet, Ella's has expertly mixed cocktails, house-made salad dressings and bread dipping oil, inventive entrees, and desserts that will force you to groan around your fork. 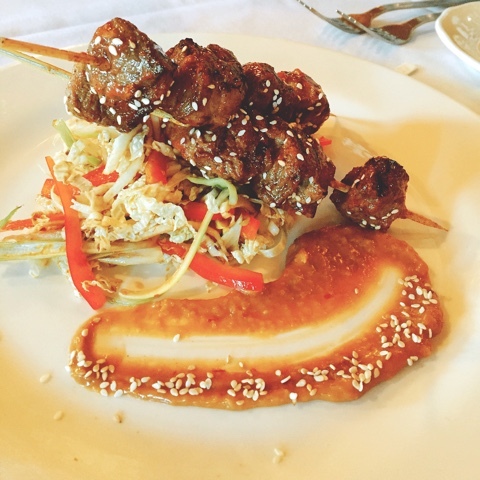 I encouraged you all to choose Ella's for a summer date night, and I'm reinforcing that recommendation all these months later, because it's that good there. Who would have thought it? I'm a sentimental sort of fool. I know this about myself. I'm sad to see Chef Carol retire and close up her Dongan Hills landmark in Staten Island. And so, in celebration of her decades of excellence, I am awarding Carol's Cafe Best Restaurant of 2016. We took new friends there over the summer, before learning it was closing, and I'm so glad we got a last visit in. If you read this and live downstate, there is still time - she's open until December 31st, so run, don't walk, to get your chocolate souffle, liver and onions, and caramel shrimp. Thank you, Carol, for feeding us so well all these years, and enjoy your retirement! Well, that's about it from me until after Christmas, Hungries. Congratulations to all the big winners. Um, don't, like, watch the mail for your award or anything. These are more pay-on-the-back, bragging rights kind of accolades due to another year of budget constraints around the Big Hungry homestead. But I send thanks to these local restaurants along with my congratulations, because finding food this good in our little paradise of New York State is always a pleasure. Your hard work and dedication to feeding people well is why I blog, and it really makes a difference in our communities.